Irish America – Sara S. Goek, Ph.D.
A post from The Dustbin of History in honour of St. Patrick’s Day, 2014. 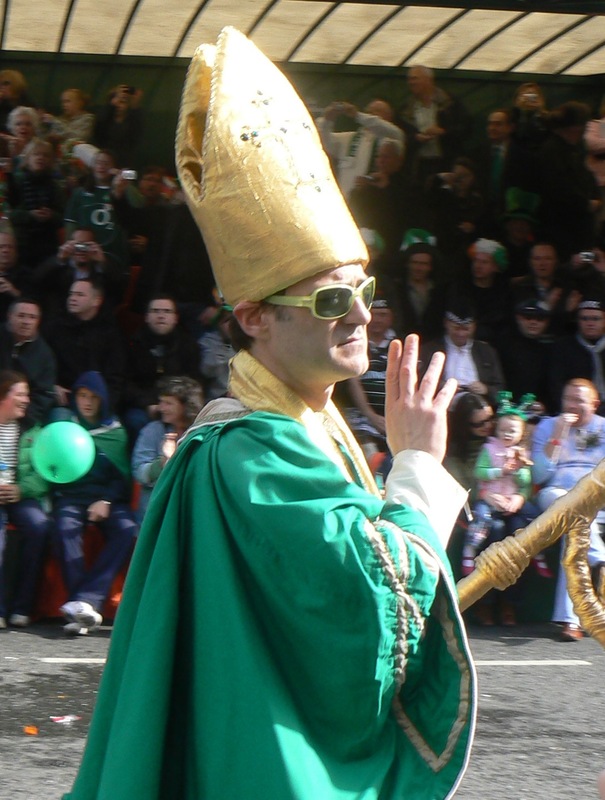 With the importation of American-style parades, sequined shamrocks, and green beer, St. Patrick’s Day in Ireland has come to seem more and more Irish-American. Meanwhile the mass exodus of politicians to the US and other parts of the world for March 17th continues as they court the now-powerful descendents of Irish emigrants. Buried under a landslide of books for my PhD and assailed by news articles and ads on the upcoming holiday, I have realized that few critically question these developments or our assumptions about them – if we say St. Patrick’s Day is Irish-American, then what is Irish America really? Viewed historically this presents less of a problem: successive waves of Irish immigrants settled largely in urban areas where they worked and lived with other Irish people, participated in Irish cultural events, went to the local Catholic Church where there was often an Irish priest, and wrote letters to relatives in Ireland and across the globe. But what about today? Historians speak about ethnic groups in an amorphous sense but few engage with the more ambiguous markers of ethnic identity in the present or only seem to notice those who actively participate in maintenance of that identity, those who take Irish dancing or language classes or, in the case of The Gathering last year, those with enough money to make the trip across the Atlantic to the ‘old country’. What about the rest? Whatever it is, there is no doubt that Irish America is rooted in history, particularly the Famine of 1845-9. Social anthropologist Reginald Byron’s book, misleadingly titled Irish America (it’s about Albany, New York), attempts to link that history to contemporary identity. While putting the Famine at the centre of the Irish American experience places Byron in good company, his account of Irish history and the history of the Irish in America largely ends with the mid-nineteenth century and he is vague about how many of his informants might actually be descended from famine-era immigrants as opposed to earlier or later generations. After all, while approximately 1 million people left Ireland in the famine decade, emigration had begun before then and 3.5 million left between 1855 and 1921 and in all cases a large proportion ended up in the United States, though sometimes by more circuitous routes. The danger of focusing so intensely on the Famine as to give it a mythic quality is that doing so can ‘obscure the diversity of Irish migration and its changing character over time’. Byron’s repeated emphasis on the ‘famine generation’ belies his otherwise patent goal to ‘dispose’ of ‘pervasive myth’. Irish America was never one homogenous entity, never solely the victims of starvation and oppression; that in itself is a myth. It was and is more akin to a historically grounded, continually negotiated, and multi-faceted idea, aspects of which individuals might choose to accept or reject. When we say an idea or ethnic identity is rooted in history or a sense of the past, what does that mean exactly? Whose history? What history and where? Byron focused his questions on two areas: Irish history and family history, but found his informants’ knowledge of both lacking when he asked them to name major events in Irish history and why their ancestors left. He concludes, ‘for the great majority of our informants, the links with the past had been broken, and no family traditions of Irish history or stories of the circumstances of their ancestors’ emigration have been passed down to the present generations.’ Is it really so surprising that people in the 1990s (when he carried out his research) do not know the exact reasons their ancestors left Ireland a hundred-plus years ago? How many people do know their full family history back five or more generations? Byron seems interested in these ‘links with the past’ only when they pertain to Ireland – why not the experience of the Irish in America? By asking about Irish history and reasons for leaving Ireland he seems to query the authenticity of Irish America in calling itself Irish at all, as opposed to examining what it is in and of itself. Irish immigrants and their descendents worked as everything from miners to mayors, domestic servants to democratic senators, but in the process they often faced discrimination, company exploitation, and poor housing, all of which have shaped the historical narrative. For me, the more interesting questions are related to why individuals today want to have an ethnic identity and how and why those of mixed ancestry end up emphasizing one branch of the family over another. What does it mean to be Irish-American or ‘of Irish extraction’ today? How does drinking green beer have anything to do with it? Is being ‘ethnic’ in America anything more than a fad, a by-product of embracing multiculturalism? The commonly quoted statistic is that roughly 40 million Americans write ‘Irish’ in the ethnic section of the census form, but what this means may differ between individuals. For some, it may simply be a fact of ancestry. 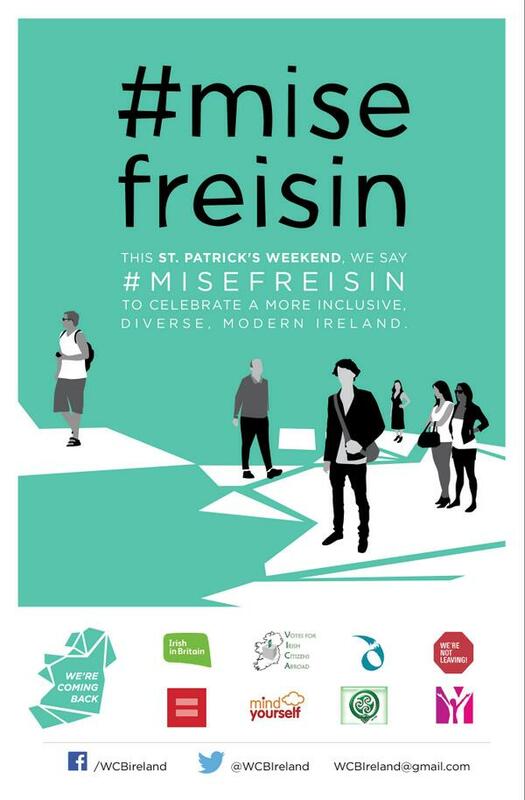 For others, it surfaces in the form of participation in St Patrick’s Day celebrations or a holiday in Ireland. For others, it may be more a part of everyday life. When Humans of New York published this photo and caption, the comments zeroed in on questioning the man’s Irishness, not the central lesson of tolerance. Both Ireland and Irish America may have a lot to learn about each other and about the value of accepting diversity in what it means to be Irish. Kevin Kenny, Diaspora: A Very Short Introduction (Oxford, Oxford University Press, 2013), p.29. Reginald Byron, Irish America (Oxford, Oxford University Press, 1999), p.54. Kathleen Neils Conzen, et al., ‘The Invention of Ethnicity in the United States’, in Jon Gjerde (ed. ), Major Problems in American Immigration and Ethnic History (Houghton-Mifflin, Boston, 1998), pp.22-9. This is despite the fact that he realizes, ‘by and large, our informants’ recollections of their family histories do not extend back to Ireland, but begin only in America’ (emphasis added). Bryon, Irish America, p.80. For a more thorough assessment of these issues see: Mary Waters, Ethnic Options: Choosing Identities in America (University of California Press, 1990). Christine Legrand examines the implications of ‘being of Irish extraction’ and argues that it is ‘a matter of personal choice’ influenced by family and the feeling of shared history or values. ‘Nation, Migration, and Identities in Late Twentieth Century Ireland’, Narodna Umjetnost: Croatian Journal of Ethnology and Folklore Research, vol.42, no.1 (June 2005), p.51.